Pictured above is Gypsy, 1 1/2 year old Siberian Husky female who was just rescued by Husky Haven of Los Angeles from the South Central LA shelter. Gypsy is a virtual skeleton and was full of worms. Her abdomen has a bad rash and she has a skin condition on her back. The photo shows Gypsy is eating her first meal which consisted of Natures Variety Instinct rabbit to help her dermatological problems. She is extremely thin and very sick. Poor Gypsy did not even know what a blankie was for. Rhonda saved her from South Central Shelter and her lifeless skeleton was placed in her car. Rhonda brought her back to her rescue facility (along with 4 other dogs) and gave Gypsy a blankie to sleep on. Gypsy instead went to sleep on the gravel instead. Rhonda had to coax her and show her what to do--poor doggie had never even known any type of human kindness such as a blanket! 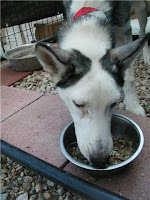 Ask Ariel has donated food and supplements for Gypsy's care but much more is needed. 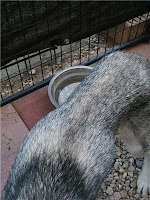 Rich at Wildside Salmon donated many cases of Wildside salmon oil for pets and healthy Wildside salmon treats to Husky Haven. Many thanks to Wildside Salmon for their generosity.